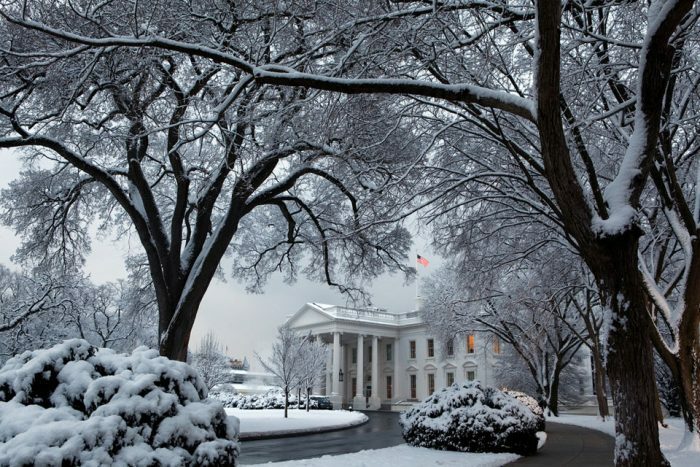 The White House Correspondents’ Association is pleased to announce the winners of its 2012 journalism awards. Ten journalists have been chosen as the winners of three prestigious awards, along with two honorable mentions. Two of the winning submissions underscore the importance of teamwork in achieving journalistic excellence. 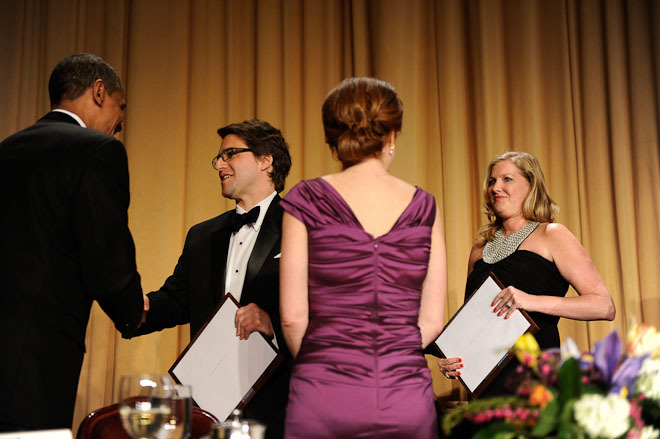 The WHCA℠ looks forward to honoring the talented recipients at our annual scholarship dinner at the Washington Hilton on April 28, 2012. 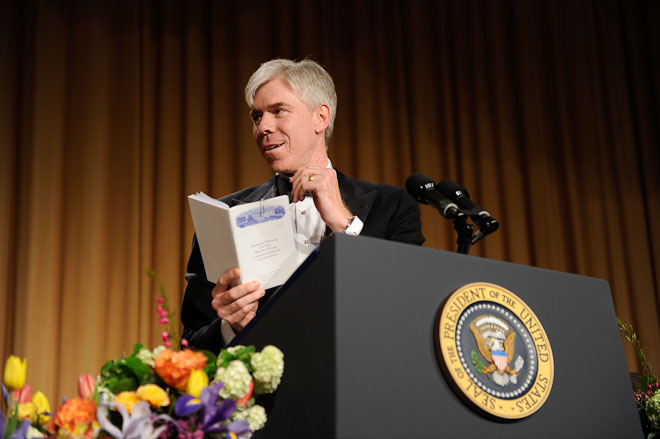 David Gregory in 2012 at The White House Correspondents Dinner. 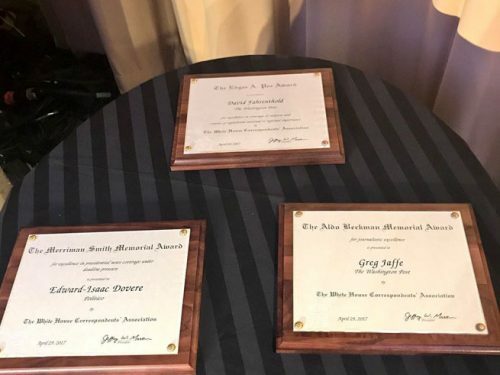 ABC’s Jake Tapper and Politico’s Glenn Thrush, Carrie Budoff Brown, Manu Raju and John Bresnahan were selected as winners of the Merriman Smith award for excellence in presidential coverage under pressure in the print and broadcast categories. Each award carries a $2,500 prize. Tapper, the broadcast winner, broke the news that rating agency Standard & Poor’s was on the verge of downgrading America’s triple-A credit rating because of concerns over political gridlock in Washington. 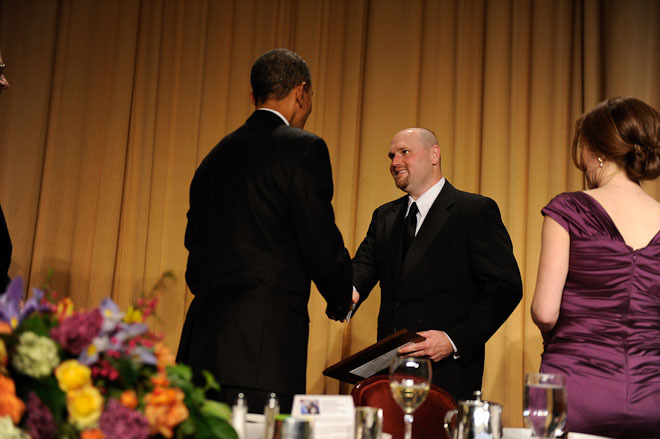 President Obama congratulates Politico’s Glenn Rush, 2012 Merriman Smith Award recipient. 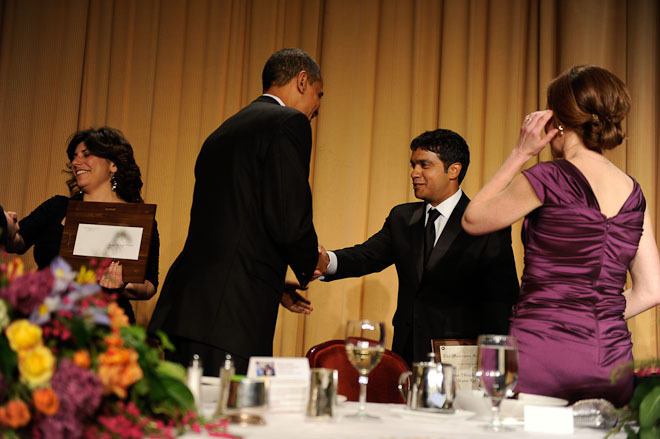 President Obama congratulates CNN’s Manu Raju, 2012 Merriman Smith Award recipient. 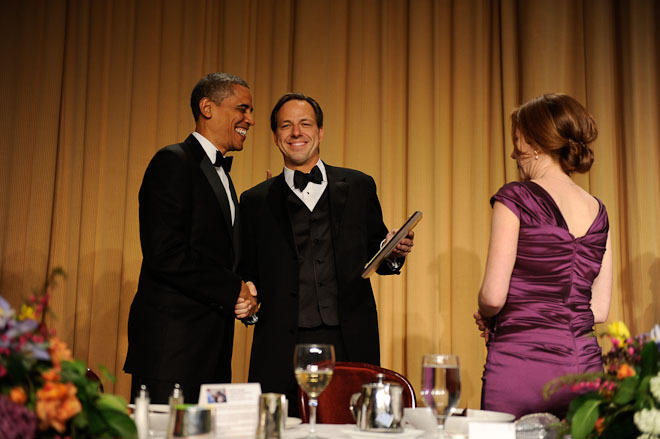 ABC’s Jake Tapper is congratulated by President Obama on his 2012 Merriman Smith Award for xcellence in presidential coverage under pressure in the broadcast category. 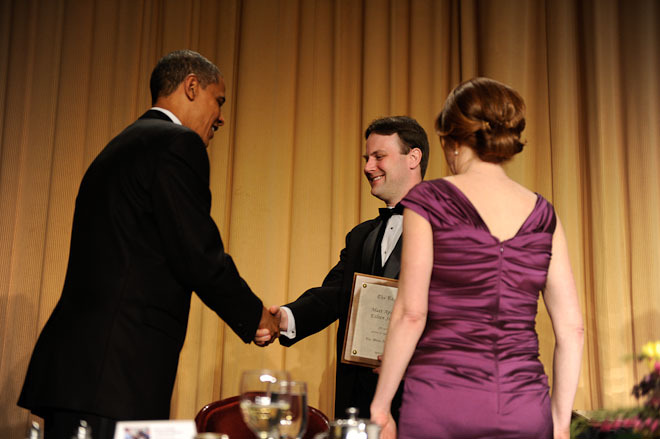 Scott Wilson of The Washington Post won the Aldo Beckman award, which recognizes a correspondent who personifies the journalistic excellence and personal qualities of Aldo Beckman, a former president of the White House Correspondents’ Association℠ and a correspondent for the Chicago Tribune. The Tribune and the Association, which established the award in 1981, will give a prize of $1,000. An honorable mention is being awarded to Politico’s Glenn Thrush for the quality and breadth of his reporting and the clarity of his writing. 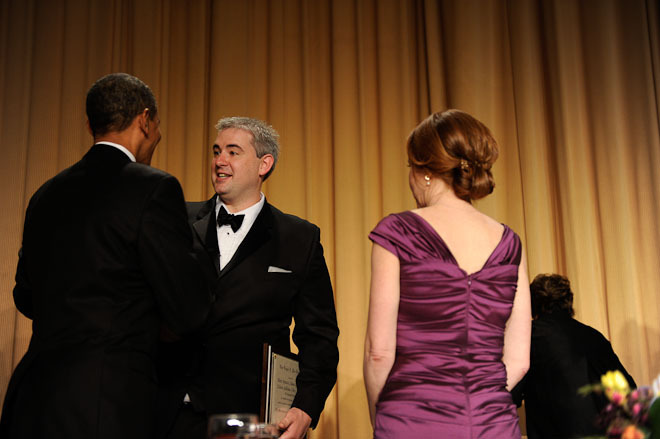 Aldo Beckman Award recipient Scott Wilson, The Washington Post, is congratulated by President Barack Obama at the 2012 White House Correspondent’s Associate Dinner. The $2500 Poe award is funded by the New Orleans Times-Picayune and Newhouse Newspapers in honor of their distinguished correspondent Edgar A. Poe, a former WHCA℠ president. An honorable mention goes to Damian Paletta of the Wall Street Journal for his series of stories on the divisive debate about Social Security Disability Insurance. Paletta brought the debate vividly to life in a series of stories underpinned by deep analysis of the data. 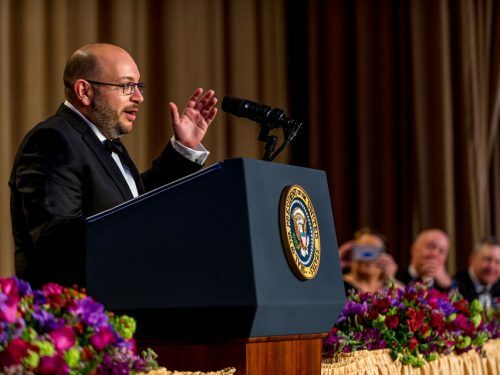 The WHCA congratulates the winners and we thank everyone who submitted applications for the awards. 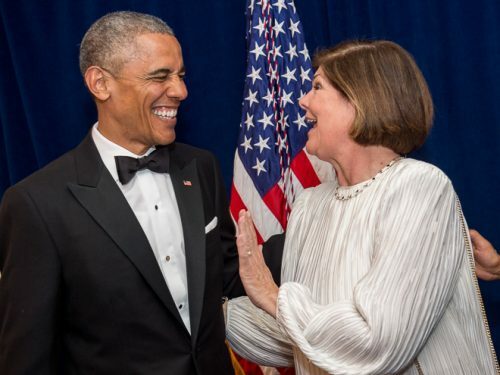 For more information contact, Julia Whiston, Executive Director WHCA℠ at 202-266 -7453 or April Ryan, Awards Committee Chair, at 202 285 3557, aprilryan1600@gmail.com.